Breakfast is considered by some to be the most important meal of the day. This is because it will dictate the energy and productivity level of the person for the day. Therefore, it is important to consume healthy food during breakfast. Two famous healthy breakfast favorites are oatmeal and granola. However, most people could not distinguish one from the other. In this article, we will learn their differences. Oatmeal is a breakfast food made of oat grains. The oat grains are processed using different methods: grinding, steel-cutting, or rolling. It is usually consumed by adding warm water and either sugar and salt to taste. Its texture is mushy when water is added. It is believed by some that daily consumption of oatmeal can help lower cholesterol levels. Oatmeal has high content of beta-glucan which is said to help reduce the risk of heart disease. 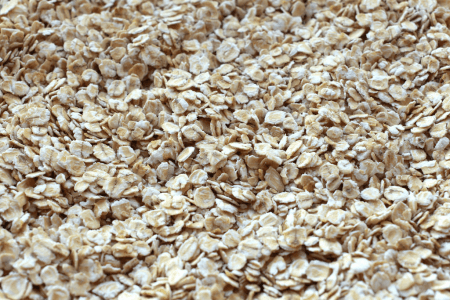 Weight trainers patronize rolled oats because of their high content of complex carbohydrates. Rolled oats also has water-soluble fiber that slows down digestion and stabilizes blood-glucose level. 1/2 cup contains 150 calories, 5 grams of protein, and 27 grams of fat. Granola is a breakfast and snack food made from rolled oats, nuts, and fruits. Sweetener is usually added into the mixture. It can be brown sugar, honey, or molasses. The rolled oat mixture is further processed by toasting or baking. Granola is often consumed with milk or yogurt. It is sometimes further processed to become granola bars, wherein the granola mixture is pressed into a bar shape and baked. Granola contains dietary fiber that helps prevent constipation and regulate proper digestion. It is also believed to aid in weight loss, improves the health of the heart, and promotes proper organ function. 1/2 cup contains 200 calories, 6 grams of protein, and 39 grams of fat. Granola is popular in the United States, Canada, Australia, and New Zealand. So what is the difference between oatmeal and granola? It turns out they are very different in terms of their ingredients, consumption, health benefits, and types. Oatmeal is made from oat grains while granola is made from rolled oats, nuts, and fruits. Sweetener is also added into the granola when toasted. Oatmeal is consumed when water and sometimes sugar or salt is added. On the other hand, granola is eaten with milk or yogurt. Oatmeal helps lower blood cholesterol and reduces the risk of heart disease. It also slows down digestion and stabilizes blood-glucose level. 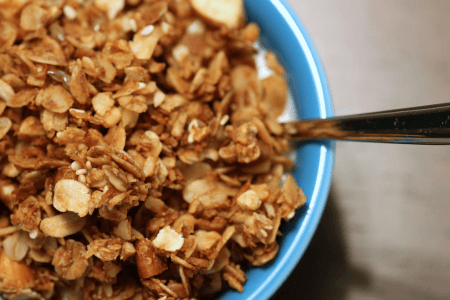 Because the main ingredient of granola is oatmeal, it has similar health benefits. Granola helps prevent constipation and regulate digestions. It also promotes proper organ function and aids in weight loss. 1/2 cup of oatmeal has 150 calories as compared to granola’s 200; it also has 5 grams of protein while granola has 6; and it has 27 grams of fat while granola has 39. Oatmeal can be ground, steel-cut, or rolled. On the other hand, granola can be plain or processed to become granola bars.